Shade Fabric Cloth can be used to protect your patio,lawn garden,greenhouse,swimming pool,Car park shading,dog Kennels and Canopies,Backyard Dog Runs,Camping site shading and hatch back curtain;also This Aluminet shade sun cloth net can create shade ANYWHERE you need, including plant cover, shade tarp, truck cover, enclosure, site barrier, privacy fence, kennel cover, cucumbers, strawberries, watermelons, lettuce and pole beans and other outdoor living place.It relfect harmful UV sunrays and decrease termperature significantly than regular shade fabrics. Shade Mesh is made with High Density Breathable UV Stabilized Polyethylene. #Light Weight and Durability make it a superior choice for all types of shade applications. #Breathable Mesh blocks up to 70% of UV rays, dramatically lowering the temperature and creat cool comfortable outdoor space. #Ideal for Patio swimming pool ,carports or other outdoor area. PREMIUM MATERIAL: The Sunblock Shade Cloth is made of UV stabilized polyethylene(high density HDPE),which is different from ordinary sunshade nets.It has anti-aging,corrosion main features,applicable for livestock housing,poultry buildings,greenhouses,hoop structures,barns,kennels and more.If have any quality problem within 5 years,please contact us at the first time. 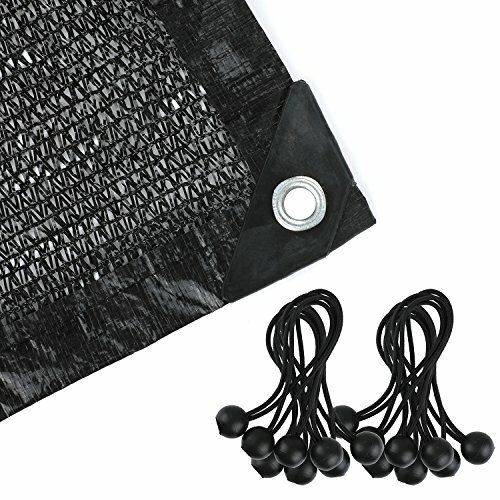 UNIQUE DESIGN：Our Shade Cloth has taped edge with 2 grommets on every meter(bonused with enough Bungee Balls).For you to easy to hang up,meet your different needs,more stronger and stable than others. UV PROTECTION: Shade Netting Mesh blocks up to 70% of sun,make your greenhouse be more powerful,preventing from sun's harmful uv and insect pests. MORE FUNCTION: Lightweight and Durability Shadecloth can be used to protect your plants from the over sun over heating,also you get a more comfortable outdoor living place when use it as a sudden shade. If you have any questions about this product by smartelf, contact us by completing and submitting the form below. If you are looking for a specif part number, please include it with your message.